Walked in and immediately asked to extend my stay. "Professor" Steve is hilarious and has a recommendation for anything and everything to do around the area. Had a lovely three nights making dinner with other guests and having movie nights on the big couch. The guides that do the waterfall tours are so kind, and were very patient and helpful going down the waterfall with me. DEFINITELY STAY HERE!! Love this hostel, Steve is awesome, great vibe, great region, favourite place and stay in El Salvador! Chill hostel. Very clean, close to city centre, met some cool fellow backpackers. Steve, one of the owners there running the hostel was so helpful, always had great suggestions for things to do. I had injured ankle and couldnt do all activities, so Steve went out of his way to find a pupuseria so I could practice making pupusas and he also helped me carry my backpack to bus as I was in cast. Place is full of charm as well. I highly recommend this hostel! We spent 5 nights using the hostel as a base to explore the surrounding towns (we originally planned only 2 nights but liked it so much we stayed longer). It was perfect for this with great information and impartial advice from Steve (one of the owners) who was extremely welcoming and helpful. The seven waterfalls hike was amazing and great value for money. The zip lining and coffee tour in Apaneca and Ataco respectively are both well worth a go. Really nice and clean hostel. Friendly staff. 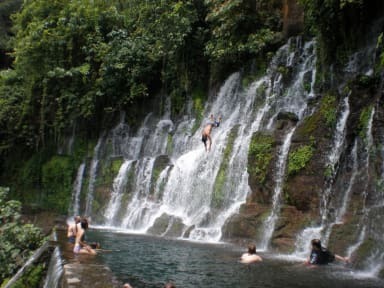 The los chorros waterfall tour from the hostel is awesome. 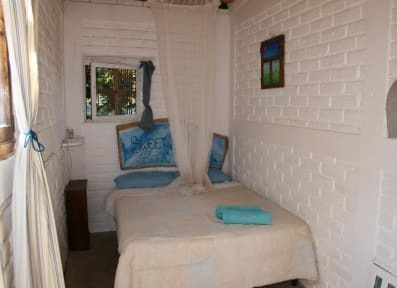 Very nice hostel, friendly staff, with spacious room. Althought we booked private room and hot water didnt work so were told to use the communcal showers also bins in the room werent emptied during stay. The gardens are lovely to relax in and door always locked so very secure. A nice place for a relaxing stay with a good kitchen. However the room is too hot and needs a fan and when I asked they didn't have one. Also there's only one bathroom to the whole hostel.